The Superior® UVF delivers a vent-free firebox that can be installed just about anywhere in the living room or family room of your home, apartment, or condo. Because there is no chimney, it is a perfect choice for renovation or remodeling. These units are easy-to-install firebox enclosures that will accommodate a variety of vent-free gas log sets. With a realistic brick-lined interior and heat circulating performance, the UVF is a versatile choice that is designed to deliver supreme peace of mind and comfort. 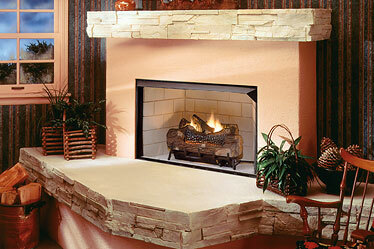 Large opening, clean-face, louverless design firebox complements current trends in home design. Traditional brick-patterned liner (back and sides) gives the look of custom masonry realism. Easy-access gas line features knockouts on both sides for quick and simple installation. Compatible with any listed ANSI Z21.11.2 vent-free log set. Choose a beautiful Superior® or Lennox™ vent-free log set for best results.